Catalogs CDs, MP3s and vinyl records into a fully searchable database. Automatic entry of CDs and records from 5 internet databases. Enters all available CD, vinyl record and track information - including artist name, title, label, release year, track information, roles/credits, and much more! With powerful filtering capabilities, it displays and prints any CDs, records or tracks that you want, or create HTML, PDF, Word, Excel, XML and RTF docs. Music Catalogue Master catalogs CDs, MP3s and vinyl records into a fully searchable database. It automatically enters CDs and records from 5 different internet databases. It automatically downloads and enters all the available CD, vinyl record and track information into its database - including artist name, title, label, release year, cover art - all track titles, artists and track times as well as roles/credits, and much more! You can create as many user-defined tracking categories as you want, and attach as many of these as you want to any CD, record or track. For collectors who wish to track multiple copies of the same recording - there is a whole separate area for information about copies you have, like purchase price and current value. 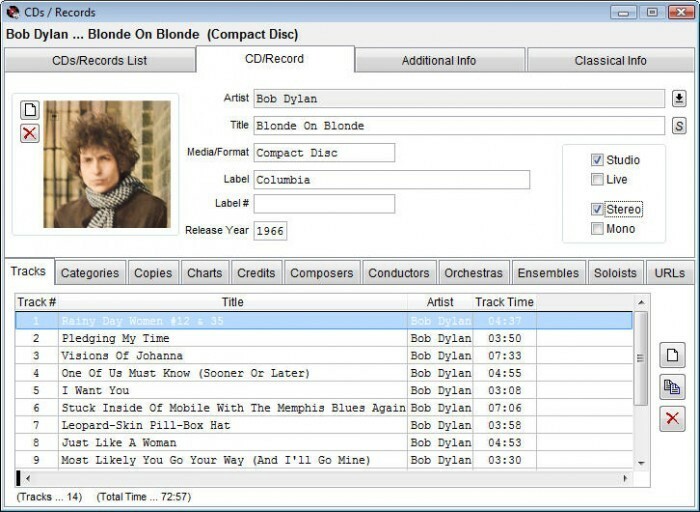 Music Catalogue Master also allows you to track chart information for all CDs, records and tracks. With its powerful filtering capabilities, you can display and print any CDs, records or tracks that you want, based on any criteria that you want - and print a report or export the reports to HTML, PDF, Word, Excel, XML, RTF and MHT documents. It also comes with MP3 Catalogue Master ? a utility for tracking and playing your MP3 files. Music Catalogue Master has an intuitive interface and many shortcuts to enable you to quickly enter and format information. It is easy to move around and find the information that you want to display and print. It also comes with complete Help and a downloadable printable manual.